The Moon is constantly gardened, sanded and smoothed by a continuing rain of tiny impacts. This hides the original details of the surface. Craters cut down through the surface, exposing a cross-section of the rocks they penetrate, but over time the cosmic gardening smoothes and hides the details previously exposed in their rims. But in a relatively young crater like Pytheas, in south-central Imbrium, very high-resolution images taken by the Apollo 17 Panoramic camera reveal the structure of the mare. Horizontal layering in the mare is evident by the faint parallel banding. This shows that the mare did not form by one vast and deep outpouring, but by many thin flows that piled on top of each other. Dark material – ash? – is visible in some of the banding and a broad expanse occurs along the wall. 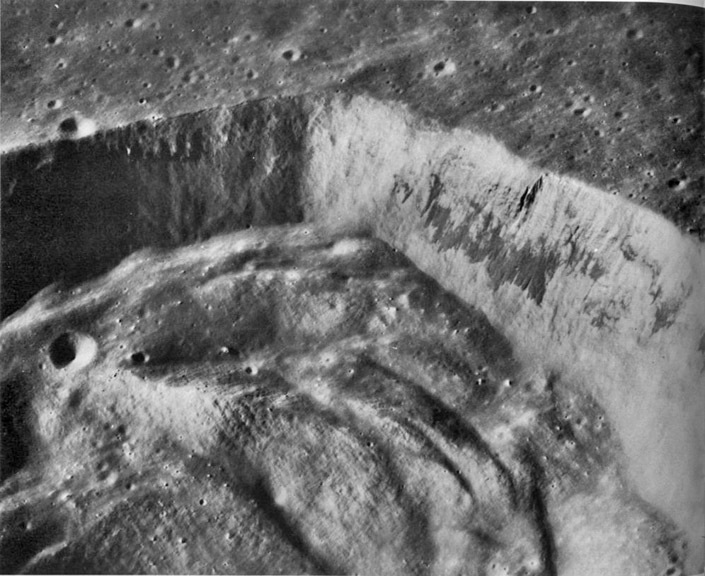 The diameter of Pytheas, as is true for all lunar craters, was widened by the slumping onto the floor of rock masses that were previously flat-lying. If you look closely at the slump mass in the middle of the photo you can trace the original mare layers. As has been noted before, travel into a crater like Pytheas would be nearly impossible because of its steep walls. Apollo 17 image AS17-3081. Pytheas is 20 km wide and 2.5 km deep. Did you notice the shift of the menu column from the right to the left side? I hope this helps view wide images. Test it out by looking at the Feb 28 LPOD. This page was last modified on 29 April 2016, at 01:04.